These are by far the most lovely baked item I have made lately. They set up perfectly and were spongey and light just as they should be. The icing was also nice, it set up perfectly and had a very nice sheen. I got the recipe from The Food Network website, but made a few slight changes. Beat the butter at med speed until smooth, about 2 minutesIncrease the speed to med-high and gradually add the sugar, beat until the mixture is light and smooth, about 2 minutes. This was way too much icing for the number of cupcakes that this recipe makes, you could cut it back or freeze the remaining icing, which is what I did. I added: 4 - 5 T of coffee to half of the icing which gave it just a hint of coffee. 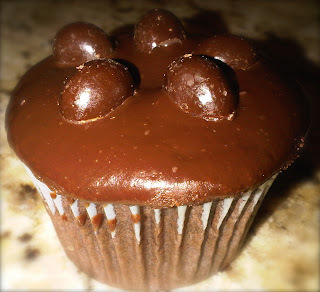 I topped part of the cupcakes with m & ms and the other part with chocolate covered espresso beans. 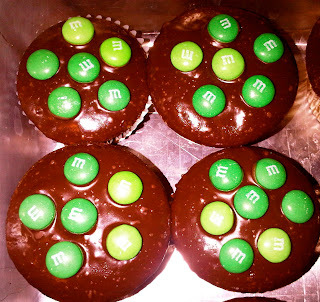 Mint extract or coffee liqueur could also be added to the icing, as well as berries or peppermint crumbles added atop the icing.